Photo by IowaPolitics.com with Flickr Creative Commons License. 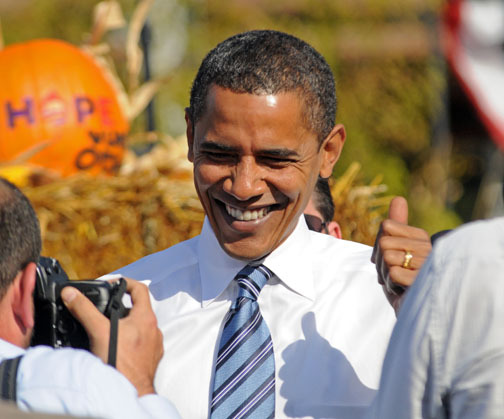 President Obama’s job approval ratings among Marylanders have remained consistent during his last two years in office, a new Goucher Poll finds. Fifty-three percent (53%) of Maryland residents approve of the job he is doing, while 38% disapprove — nearly identical to the results found in the September 2014 Goucher Poll. Marylanders continue to express their disapproval with Congress; 83% disapprove of the way Congress is handling its job. The disdain for Congress is fairly uniform regardless of party, gender, race or age. UPDATE 10/6, 8:15 a.m.: If the Democratic primary were held today, 43% of Maryland Democrats say they would vote for Hillary Clinton, 23% for Joe Biden, and 17% for Bernie Sanders. Mirroring nationwide polling, 2% of Maryland Democratic voters would support former Governor Martin O’Malley’s bid for the Democratic nomination. When asked for the most important issue in determining their vote, 33 percent say economy, budget, or tax issues; 13 percent say international affairs or foreign policy; seven percent say women’s issues; and six percent say education. 62%: Undocumented immigrants should be allowed to stay in their jobs and eventually apply for U.S. citizenship. 13%: Undocumented immigrants should be allowed to stay in their jobs only as temporary guest workers, but not to apply for U.S. citizenship. 20%: Undocumented immigrants should be required to leave their jobs and leave the United States. Residents were also asked whether they thought the number of undocumented immigrants coming to the United States in the past decade has increased, decreased, or stayed the same. Seventy-three percent of Marylanders think it has increased, 14 percent think it has stayed about the same, and 8 percent think it has decreased. According to research from the Pew Research Center based on Census population estimates, the number of undocumented immigrants coming to the U.S. has stayed about the same since 2005. Gov. Larry Hogan gets positive approval ratings in the latest Goucher College poll, as does one of his top priorities this fall, an independent redistricting commission, but it is not an important issue to most residents.